Today we thought it would be fun to give you the chance to get to know us a little better, and to give you a glimpse into what a day at Color Concepts is like. For those of you who have not had the opportunity to pay us a visit, please consider this an open invitation to visit either or both of our labs, located in The Netherlands and the United States. This is the Color Concepts headquarters, located in Capelle aan den IJssel (near Rotterdam) in The Netherlands. Our CEO, Marco Roos, started the company in 2003. Since then, Color Concepts has grown and evolved. This office is considered our headquarters. 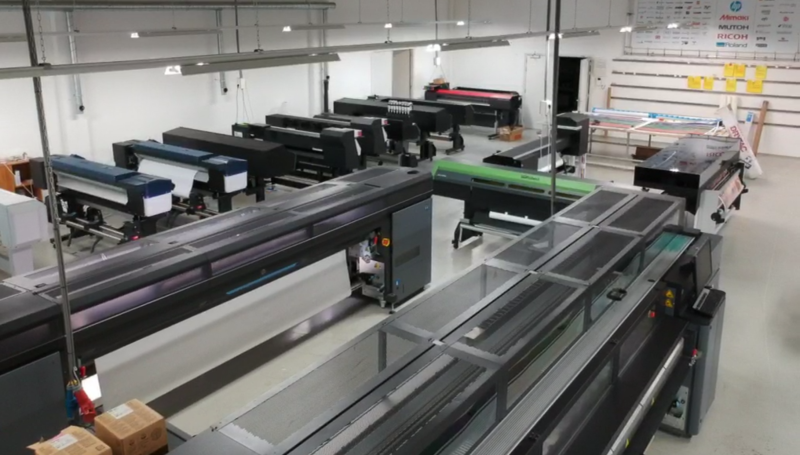 It is home to the majority of the Color Concepts team and a lab that currently houses over 20 wide format inkjet printers. As you can see, this requires quite some space! While some of you might use such a space for storing muscle cars or setting up a new axe throwing space, we love to bring in a new printer every month. That’s where our nerdiness kicks in and you see our team go nuts! This is Color Concepts of North America, located in Salt Lake City, Utah, United States. This office has been operating since 2013. Visitors are curious about what we do in our labs. This is where the magic happens! You will find our profiling engineers bustling around to complete media testing – loading and unloading media, utilizing Barbieri spectrophotometers to measure color targets, importing ICC profiles into RIP software to create print profiles, printing on a wide variety of media to test media/printer/RIP compatibility. These engineers certainly keep busy as they keep our printers printing! Our North American lab is housed in a smaller facility, but we execute the same services and testing here. Here you have a glimpse of our Salt Lake City location. In addition to media/printer/RIP testing, our Salt Lake lab also is home to the Barbieri Service Center for North America. This is where we service Barbieri spectrophotometers. We provide device calibration services as well as repair. We operate the only authorized service center for Barbieri in North America. Our teams both work and play hard together. Color Concepts is more than a workplace – it is a culture. We have created an environment in which people are encouraged to explore and be curious. We motivate and inspire each other, and we have a lot of fun in the process. With employees in three countries and customers all over the world, we believe that fun and good times are part of the journey. We are excited to have customers and partners visit our labs. Let us know if you are ever in the neighborhood. We would love to show you around our facilities, talk a little more in detail about our services, offer you an INCREDIBLE cup of coffee and give you space to work if you have time to kill!